FREE wifi is to be rolled out across the city centre from this summer – promising no-cost high-speed internet access 24 hours a day and improved mobile coverage for residents and visitors from Queen Street to the Meadows and Haymarket to Holyrood Park. Installation begins next week and the whole scheme should be live by the autumn. The city council has signed a ten-year contract with intechnologyWiFi, which has been granted exclusive use of city street furniture and properties. Council bosses believe the move will boost the city’s economy by increasing footfall in the centre and will make it easier for tourists to find places to eat and get details of visitor attractions. IntechnologyWiFi will install and operate the wifi network at no cost to the council. The programme has been funded by the UK government as part of its Super Connected Cities programme, which saw more than £5 million awarded to Edinburgh. Users of the service will also benefit from savings to their mobile data plans, by being able to access the internet at no cost, and without restrictions on time, while on-the-go. IntechnologyWiFi has provided internet connectivity for major music events such as the Reading Festival, Download, Latitude and Creamfields. It has recently installed free wifi in Watford town centre and has agreed a deal with the English Football League to provide stadium wifi connectivity to clubs across its portfolio. The company says the state-of-the-art equipment it will use to provide seamless, easy-to-access internet coverage is in contrast to the traditional hotspot model, which usually gives connectivity in a specific area. The announcement of the Edinburgh contract came as research by YouGov revealed that 43 per cent of people in Britain are frustrated by the lack of free, public wifi networks across the UK. John Donnelly, chief executive of Marketing Edinburgh, said the new service would encourage visitors to share more pictures of the Capital, raising the city’s profile. He said: “The new free wifi service across the city centre will connect visitors and residents to Edinburgh on a whole new level. The launch of the wifi network is the final project of the council’s Connected Capital programme, which aims to make Edinburgh one of the best-connected cities in Britain. There is already free wifi on all trams and Lothian Buses, as well as in almost 70 key public buildings. And the broadband voucher scheme – now closed – has provided over 970 businesses in the city region with faster broadband connections. Some cafes currently offer free wifi as a way of attracting customers, but Gordon Henderson of the Federation of Small Businesses does not think generally available free wifi will hit such venues. “I think cafes will still offer free wifi and it will still be attractive,” he said. But he said the new service offered great opportunities through advertising to local businesses. He said: “If you’re a tourist walking through the centre and you get a close to a pub, will it be able to have an advert pop-up saying ‘Are you hungry? We’re just across the road’? He said some people would be worried about the huge amount of usage data that would no doubt be collected from the free wifi. But he said: “I think we’re all savvy about that – if you connect to wifi someone is going to collect information about what you’re surfing. She said 24/7 internet connectivity would make it second nature for people to live “more connected lives”, including accessing live news, finding out what’s on in real-time, or booking a meal or a bed for the night. 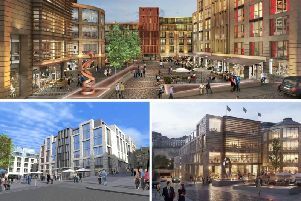 Edinburgh is one of 22 cities across the UK that has benefitted from the UK Government’s £150m Super Connected Cities programme.